Next week is Negroni Week (June 2–8). The idea behind Negroni Week is that participating bars around the world promote their Negroni cocktails, and donate a portion of the profits to a charity of their choice. It’s an opportunity for Negroni drinkers everywhere to join with their favorite bars to support local charitable organizations. And of course, to drink Negronis. The event is sponsored by Imbibe and Campari, and the whole thing adds up to a win-win scenario for everyone involved—Campari sells lots of spirits, Imbibe gets lots of publicity, the charities get cash, the bars sell plenty of Negronis, and Negroni drinkers get to drink all those Negronis. So you can imagine that I was delighted when Imbibe contacted me to contribute one of my own Negroni riffs to their promotion. One of the things I learned right away is that it’s a lot easer to make a variant that tastes great than it is to make one that’s original. 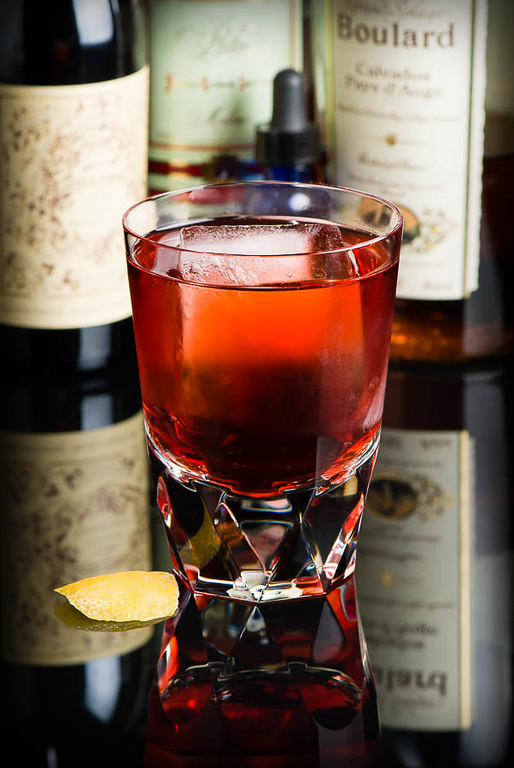 After all, the Negroni has been an attractive playground for bartenders for nearly a hundred years. The gin, the Campari, and the sweet vermouth have all been substituted, time after time. The most famous of these experiments is probably the bourbon-based Boulevardier (which has its own riff, the 1794). Tequila and mezcal variants work well, too. One of the most intriguing combinations I’ve found is what might unimaginatively be called the “Calvados Negroni.” As its name declares, it’s a simple substitution of apple brandy for the standard Negroni gin. The first time I made this version, I was happily surprised at the way the apple brandy blends with the Campari, softening the amaro’s rough edges in a way juniper-laden London gin cannot. At the same time, the Campari seems to blend into the brandy’s fruitiness, and lends a bit of an earthy note to the flavor. Of course, I’m not able to resist tinkering with the formula any more than anyone else. Bitters were not part of the original Negroni model—the Campari removes the need for bitters, in the classical way of thinking—but I just couldn’t stop myself. I found that a dose of floral bitters actually improved the drink, and resulted in a riff I call the Normandie Cocktail. The Normandie is lighter flavored than the original Negroni, more fruity than aggressively herbal, and might be a good Negroni version to serve to someone as an introduction to Campari, or to amaro drinks in general. Stir all ingredients with ice until cold; strain into a rocks glass with a large ice cube. Express with lemon, include or discard peel. The Boulard Calvados is a good choice for this drink, with a clean apple flavor and a slight sweetness that plays well against the herbality of the Campari and the vermouth. Absent Boulard, I suspect any good, slightly sweet, VSOP-quality apple brandy will serve. The Carpano Antica seems to be the perfect vermouth for the Normandie. I’ve tried it with various other common vermouths, and they all seem a bit dry for this combination. Carpano often comes accross as excessively lush in cocktails, but I suspect it’s just that lush sweetness and its faintly cinnamon character that help the flavors work together here. 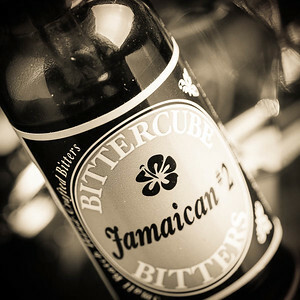 Bittercube’s Jamaican #2 bitters is a floral blend of grapefruit peel, hibiscus, and Caribbean spices. They temper the apple flavor slightly, and tighten the flavor bond among the main ingredients, in the classic “bitters as a secret ingredient” sort of way. I have no idea why it works so well, but I suspect the grapefruit ties in with the fruit elements of the other ingredients, and the spices complement the Carpano. The Normandie tastes like a very toned-down version of the Negroni, apple-fruity instead of junipery, and much softer with Campari’s herbal character. The main flavor is a slightly sweet apple profile with a long herbal and earthy aftertaste. It is just fruity enough to serve as an afternoon drink, perhaps more so than as an aperitif. I’m puzzled that I don’t find many references to Calvados or apple brandy Negronis in my bar references; this is my first step toward correcting that oversight. And it pleases me to think of the Normandie as a way to take part in Negroni Week’s Doing of Good Deeds even if you aren’t a Negroni drinker. Here’s to the success of Negroni Week! “Negroni Riffs — the Normandie Cocktail” at cold-glass.com : All text and photos © 2014 Douglas M. Ford. All rights reserved. Great post! Not having the Bittercube, I played around and substituted half a dropper of bittermans tiki bitters (for the island spice) and a half drop of bittertruth grapefruit bitters. It’s quite good but not sure if it’s similar to yours. The tiki bitters really take it to a new place, especially with the Boulard and Carpano. Kind of like a tropical negroni. Island Negroni maybe….hmmm. I better order the Jamaican #2 just to be sure. Imaginative substitution, Scot, and one I look forward to trying. I hadn’t thought of it as a tiki treatment, but yes, I can see that. Thanks for the experiment, and the idea! Yes, I like it, too. Orrefors Carat. I agree that the addition of bitters can be great in a negroni. Easy and Oskey cherry vanilla bitters take a standard negroni to the next level. A favorite negroni variant around the house is Beefeater, Cocchi Americano, Cynar, and a nice dose of Bittercube orange bitters. Thanks for all the great writing and tasty recipes! Thank you, and thanks for taking time to add your house recipe. I like the idea of the Normandie in relation to both Negroni week AND the anniversary of D-Day coinciding so I shall take this recipe with me to my drinking establishment of choice and ask for one to raise my glass to the old and new cocktails and the memory of those lost on that day of infamy. That’s an interesting observation, and an overtone I wasn’t thinking of when I named the drink. I like it, thank you for seeing that.